Taisei Kōki K.K. 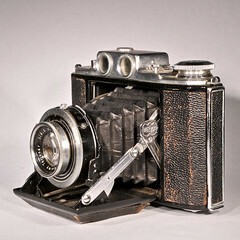 (大成光機㈱) was a Japanese camera maker based in Itabashi, Tokyo in the 1950s. All three companies Fuji Kōgaku, Katsuma Kōgaku and Taisei Kōki used the Terionar lens name, and they have similar logos, showing a cemented doublet lens scheme, with a protuberance on top, maybe an allusion to Mount Fuji. 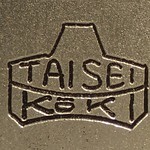 The logo used by Taisei Kōki on the Welmy range is written TAISEI WELMY. All the shares of the company were bought in August 1960 by Konishiroku. 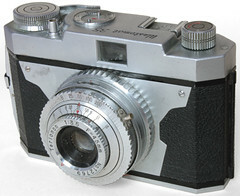 By the time, the company had ceased to sell cameras under its own name. In 1968, it moved from Itabashi to a new factory in the city of Tsuru (都留市, prefecture of Yamanashi). In 1972, the company name was turned into K.K. Yamanashi Konica (㈱山梨コニカ). In 1983, this was split into K.K. Konica Denshi (㈱コニカ電子, Konica Electronics) and other sub-companies. The company Konica Minolta Electronics Co., Ltd., distant descendent of Taisei Kōki, is still installed in the Tsuru factory. ↑ The address was Tōkyō-to Itabashi-ku Itabashi-chō 3–481 (東京都板橋区板橋町3の481) from 1952 to 1957 and Tōkyō-to Itabashi-ku Kumano-chō 45 (東京都板橋区板橋町3の481) in 1958 and 1959. Source: advertisements reproduced in Kokusan kamera no rekishi, pp.120 and 223. ↑ 2.0 2.1 2.2 2.3 Company profile of Konica Minolta Electronics, and Yazawa, p.12 of Camera Collectors' News no.247. ↑ Tanaka, p.44, and this page at Japan Family Camera, say that Fuji Kōgaku was split in two parts after the war: Taisei Kōki and Katsuma Kōgaku, with the latter keeping the Lyra brand name. This is not entirely accurate, though. ↑ Company profile of Konica Minolta Electronics and company profile of Konica Minolta Opto Products. ↑ Company profile of Konica Minolta Electronics. This page was last edited on 10 January 2017, at 04:32.